$ 24,500 Mont-Tremblant (Saint-Jovite) Ch. du Lac-Duhamel Residential #22368223 Terrain at Mont-Tremblant with access to Lac Duhamel which is navigable ... nautical pleasure in profusion! This land for sale is located in a peaceful environment and close to all services. Easy to build, electricity on the street. Come to see! $ 26,000 Sainte-Adèle Ch. du Mont-Loup-Garou Residential #24156484 Very private land located at the end of the Ch. Du Mont-Loup-Garou less than 3 kilometers from the center of Ski Chantecler. The land is wooded with mostly sloping topography. 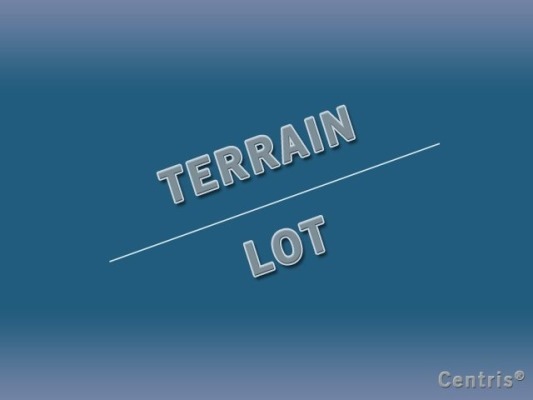 Opportunity to also acquire the neighboring land for more than 50,000 additional square feet. $ 26,000 Sainte-Adèle Ch. du Mont-Loup-Garou Residential #26848047 Very private land located at the end of the Ch. Du Mont-Loup-Garou less than 3 kilometers from the center of Ski Chantecler. The land is wooded with mostly sloping topography. Opportunity to also acquire the neighboring land for more than 50,000 additional square feet. $ 29,500 Sainte-Adèle Rue du Hameau Residential #11907347 Beautiful land with wonderful views of the ski slopes and golf Chantecler. Recent and homogeneous area with municipal water and sewer services. To see! $ 29,500 Sainte-Adèle Rue du Hameau Residential #22003991 Beautiful land with wonderful views of the ski slopes and golf Chantecler. Recent and homogeneous area with municipal water and sewer services. To see! $ 39,500 Sainte-Agathe-des-Monts Imp. du Mirador Residential #11323098 Beautiful land in the prestigious Domaine Boréal in Ste-Agathe-des-Monts. Peaceful and homogeneous environment offering access to two lakes is the Lake Azur and Lac Carré a few minutes, also several hiking trails and snowshoeing and cross-country skiing. Only 15 minutes from the village and all services. Come to see! $ 50,000 Lac-Supérieur Ch. des Cerisiers Residential #20297916 Beautiful land of nearly 2 acres in peaceful area. Very well located, Tremblant North Slope (access to slopes) is 10 minutes away, Mont-Tremblant National Park is nearby, 10 minutes from Mont-Blanc Ski Center. Cross-country skiing, snowshoeing, everything is there. This land also has notarized access to Lake Supérieur. $ 51,000 Wentworth Ch. Charlie-Chaplin Residential #14133937 Nice land on the Charlie Chaplin-way Wenthworth, easy to build. Quiet area for nature lovers, less than an hour from Montreal and 20 minutes from St-Sauveur. A haven of peace! $ 51,000 Wentworth Ch. Charlie-Chaplin Residential #21427645 Nice land on the Charlie Chaplin-way Wenthworth, easy to build. Quiet area for nature lovers, less than an hour from Montreal and 20 minutes from St-Sauveur. A haven of peace! $ 88,000 Saint-Colomban Côte St-Patrick Residential #24586948 Great opportunity, possibility to subdivide or make your own domain! Land of nearly 7 acres with 425 feet of frontage on Côte St-Patrick in St-Colomban. Near the Mtée de l'Église and services. Located opposite 451 Côte St-Patrick. $ 100,000 Sainte-Anne-des-Lacs Ch. des Pinsons Residential #23826679 A rare pearl, a magnificent 53,000 square foot lot bordered by Lake Shryer in a homogeneous and peaceful area of Ste-Anne-des-Lacs. Mainly flat and wooded terrain easy to build. A dream location! $ 124,000 +tx Sainte-Agathe-des-Monts Rue Deslauriers Residential #10862181 Rare product on the market! Large lot with nearly 34,000 square feet serviced by municipal services either aqueduct and sewer. Multifamily zoning allowing 12 dwellings on 2 floors and a half and retirement home. Area near all services, primary and secondary school, bike path, park, etc. Be quick! $ 124,000 +tx Sainte-Agathe-des-Monts Rue Deslauriers Residential #13566911 Rare product on the market! Large lot with nearly 43,000 square feet serviced by municipal services either aqueduct and sewer. Multifamily zoning allowing 12 dwellings on 2 floors and a half and retirement home. Area near all services, primary and secondary school, bike path, park, etc. Be quick! $ 139,000 Estérel Ch. Dupuis Residential #9363972 Beautiful land of nearly 53,000 square feet offering a splendid view of Lake Dupuis with access just in front (municipal). Located in a homogeneous and peaceful area, upscale home neighborhood. Very safe municipality with private patrol. Cross-country ski trail and golf nearby. An opportunity not to be missed. $ 140,000 Saint-Colomban Mtée de l'Église Residential #12474759 Superb opportunity, huge lot of 246,000 square feet on Ch. De l'Église in St-Colomban. This flat and wooded land is bordered by a pretty little stream. You will be able to build your dream home on this magnificent estate! To see! $ 200,000 Sainte-Adèle Ch. des Ancêtres Residential #21250871 Magnificent estate located in a homogeneous, private and peaceful area with superb views of the mountains and Mount Olympia. Much of the land is grassed and lined with mature trees including sugar maple, chestnut and cherry trees. Minutes from all services and access to Highway 15. $ 244,900 Estérel Place Foch Residential #19982236 Very rare product, a magnificent lot bordered by the prestigious Lac Masson (navigable) at the Estérel. Prestigious area with luxury house, 20 minutes from highway 15. Asphalt road with no exit, more than 100 feet of frontage on the lake, sloping ground giving the possibility of a panoramic view on the water and the mountains. $ 435,000 +tx Sainte-Rose (Laval) (Champfleury) Boul. des Oiseaux Residential #23346601 Rarity! Three lots ready to build on Boul. Bird, integrated project already approved by the city. Available plans, preliminary estimate of costs for water, sewer and drainage and soil survey. Opportunity to acquire 3 additional land. Sector choice close to services and Highway 15. $ 499,000 +tx Sainte-Adèle 1980A, Boul. de Ste-Adèle Commercial #22864885 Great business opportunity, B & B with excellent turnover that can be further developed. Ideally located on a main road with good visibility, the wooded lot also offers great privacy with pool and spa. The interior is warm with beautiful woodwork that pleases the customers. Come to see! $ 575,000 Mont-Tremblant (Saint-Jovite) 100A, Ch. Joseph-Thibault Commercial #10091859 Superb business opportunity, B & B with excellent turnover. Ideally located just minutes from the village of Mont-Tremblant and St-Jovite, ski, golf, etc. The property is large and bright in addition to being punctuated by mural artwork giving a unique character appreciated by the customer. To see! $ 575,000 +tx Sainte-Rose (Laval) (Champfleury) Boul. des Oiseaux Residential #28979593 Rarity! Three lots ready to build on Boul. Bird, integrated project already approved by the city. Available plans, preliminary estimate of costs for water, sewer and drainage and soil survey. Opportunity to acquire 3 additional land. Sector choice close to services and Highway 15. Sainte-Rose (Laval) (Champfleury) Boul. des Oiseaux Residential #22557167 Rarity! Three lots ready to build on Boul. Bird, integrated project already approved by the city. Available plans, preliminary estimate of costs for water, sewer and drainage and soil survey. Sector choice close to services and Highway 15.